The image above is a beautiful glimpse of the history of one of NSW most historic small towns, and one which is a popular destination for Sydneysiders looking for a weekend escape. Yet today, the attraction of Mudgee today – wine, food and beautiful scenery – is far different to those which once brought thousands of people to the beautiful area. The first European to visit the Mudgee area, and indeed the forst to cross the Cudgegong River, was James Blackman, who came to The area in 1821. It is known that some time before 1837, he had built a slab building on the site which became the Mudgee township. The town itself was declared in 1838, after other colonists had moved into the area. Indeed, almost as soon as Blackman had found a passable route, others followed, with William Lawson and the Cox family quickly establishing their own properties in the area. Before this, the traditional owners or the land were the Wiradjuri People, but after the European colonists arrived, they were systematically removed from their lands or killed. Yet in these early days of European settlement in the Mudgee area, Mudgee remained a small settlement. That soon changed though, when an enormous gold nugget was discovered in nearby Hargraves in 1851. Soon, Mudgee had become the epicentre of the many local gold fields, with enormous through traffic to Gulgong, Hill End and other gold fields. Within just 10 years the population had swelled from just 200 in 1851 to over 1500 in 1861. In 1860, Mudgee was declared as a municipality, which makes it the second oldest towm west of the Blue Mountains. Luckily for Mudgee, and unlike other gold field towns, Mudgee had never been dependent purely on gold the area around Mudgee was noted for excellent wool production, agriculture and even for its wine making (the first vineyards were established in 1858 by Adam Roth). When the gold fields began to be abandoned, it was these industries which kept Mudgee alive and sustained the thriving town. 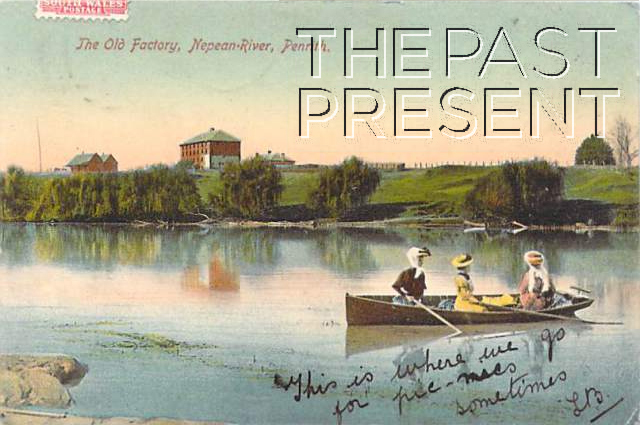 When we think of the Nepean River and Penrith area today, our minds may not turn immediately to industrial processes, yet once the Nepean River was home to many factories producing a range of materials. The postcard above shows just one of these factories, ‘The Old Factory’ which was situated on the river at Regentville. Regentville itself has a fascinating history, with the name of the suburb coming from a once famous mansion built in 1824 by Sir John Jamison. It is believed that he named the mansion Regentville in honour of the Prince Regent of the time, who later became King George IV. Jamison owned a huge property, which included land inherited from his father and various other estates which he had acquired, and his land was very productive. He established vineyard and orchards, as well as running livestock and even a horse stud on his estate, with many of the farmers working the land being of Irish descent. Of course, the factory was something a little different from these more agricultural pursuits. In the 1830s many Sydney businessmen became interested in investing money in what they assumed would be highly profitable industries, and Jamison was interested in textiles. He established a cloth mill on his estate in about 1835, using a steam engine imported for the milling of flour to run the mill machinery. In 1841 he employed Abraham and John Rayner, who were experts in the cloth trade having been born into and brought up in the industry. Sadly Jamison was in poor health and the 1840s Depression nearly ruined him, leaving him with a lack of funds to support his mill. He died in 1844 and the partnership with the Rayner brothers was dissolved. The mill continued to operated with various different managers until 1850 and in 1849 alone produced 11,500 yards of high quality tweed. The mill continued to be a picturesque building standing on the shores of the Nepean River for many years, eventually being known to tourists who passed in boating parties as simply ‘The Old Factory’. This week, with the holidays underway and many Sydneysiders heading to the country to enjoy the best Spring has to offer, it seemed the perfect time to look at one of the magnificent feats of engineering which are to be found in our many stunning national parks. Burrinjuck Dam, or Barren Jack Weir as it was once known, and as it is described on the postcard above, is just one of these. Burrinjuck Dam is on the Murrumbidgee River about 60 kilometres from Yass and today is marketed as a popular area for bushwalking, camping and water sports. Yet in 1906, when the construction of the Dam began, the scheme was created for an extremely different audience, and even today, the water is vital for reasons other than tourism. The dam was the first in NSW to be built specifically to provide water for irrigation and provided water to the government sponsored Murrumbidgee Irrigation Scheme. The scheme allowed the Murrumbidgee Valley to develop as a thriving agricultural centre, producing everything from fruit to rice. At the time when the dam was built, it was the fourth largest dam in the entire world. 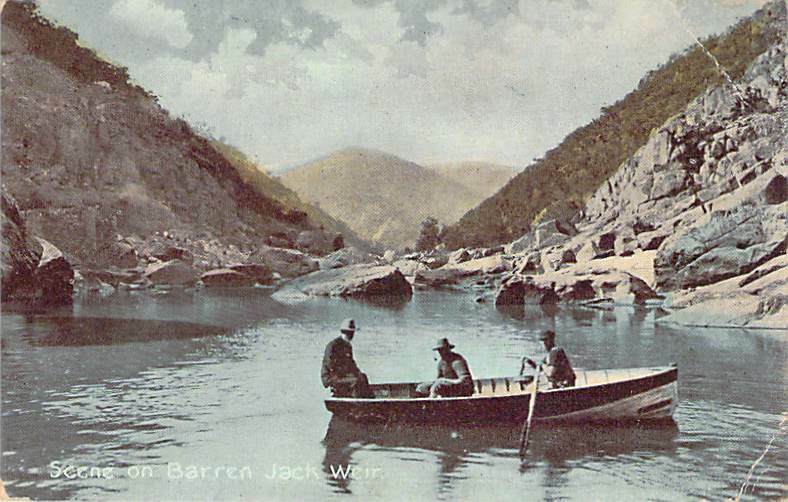 In 1911 the name Barren Jack, which the dam was originally known as, was changed to Burrinjuck, an Aboriginal word used for the area. Due to interruptions caused to construction by World War 1, the dam was not completed until 1928, but even before completion, there had been two major floods which proved the viability of the scheme. Today, between Burrinjuck and Blowering Dams (the latter of which is near Tumut), the Murrumbidge is able to provide for the irrigation needs of the Murrumbidgee Valley and the area is responsible for providing NSW with up to 90% of our potatoes, 80% of our carrots, 50% of our rice and 25% of our other fruits and vegetables. 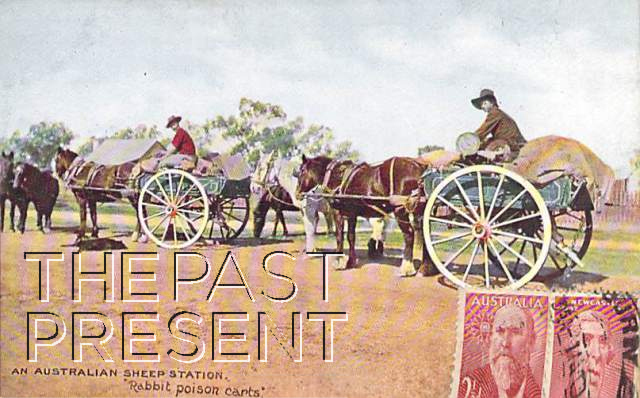 Rabbits are a well recognised feral problem today, but we aren’t the only generation to recognise them as a pest, as this postcard image shows. The the exact location of the Australian Sheep Station is unknown – perhaps it was close to Sydney, perhaps it was somewhere back of Bourke! Whatever the case, rabbits were a problem all land owners had to deal with. Rabbits first arrived in Australia when the European colonists arrived – with the First Fleet. They did not immediately become a problem though. These early rabbits were bred as food, and were kept in enclosures. Although Tasmania began to have a rabbit problem as early as 1827, the mainland rabbit population was well maintained and safely caged. Many fine houses in the colony had rabbit enclosures, and by the 1840s even the ‘common folk’ were keeping rabbits. The problem arose, it appears, when in 1859 Thomas Austin released 24 rabbits on his property in Victoria. He planned to use these rabbits for hunting purposes, but they did as rabbits do and multiplied. Other farms followed Austins lead, releasing rabbits into the wild and it was widely thought that the introduction of rabbits could do no harm. Within 10 years though, this was proven to be a massive miscalculation and 2 million rabbits could be shot or trapped each year without having a noticeable effect on their population. The image above shows just one of the many rabbit control measures which have been used in Australia. Shooting was an early control measure, but really only worked to keep already small populations of rabbits under control. Poisoning remains the most popular of the conventional control methods, and as these carts show, was quite a popular method in the early 20th century too.